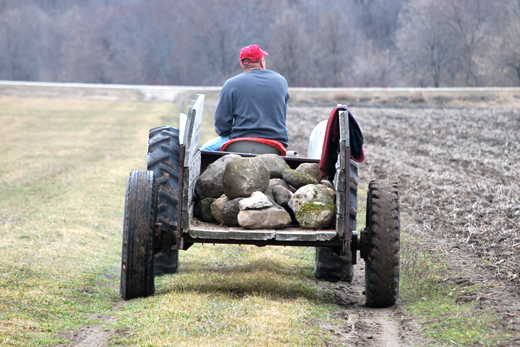 Every spring farmers have the mundane task of picking rocks out of their fields. They pick ’em, haul ’em, and dump ’em off on out-of-the-way piles in their woods or fence lines. I’ve often heard farmers complain that surely rocks grow in their fields. I’m secretly glad they do. Those rock piles provide easy landscaping for my lawn. Easy for you to say, say the farmers. And my husband, who, in an effort to please his charming (demanding) wife, has to manhandle those beasts. This past weekend he did just that. 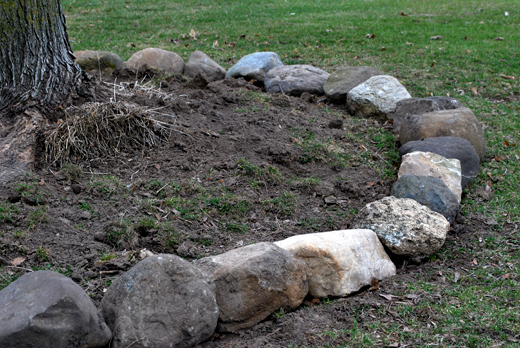 I had decided I want a rock-lined flower bed where grass doesn’t grow beneath a tree. It’s one of the many creative ideas I mastermind to bring warmth and charm to our country home. (Surely, those ideas are my husband’s favorite thing about me:-) We took a nice trip up to the woods and brought home a few well-selected rocks. 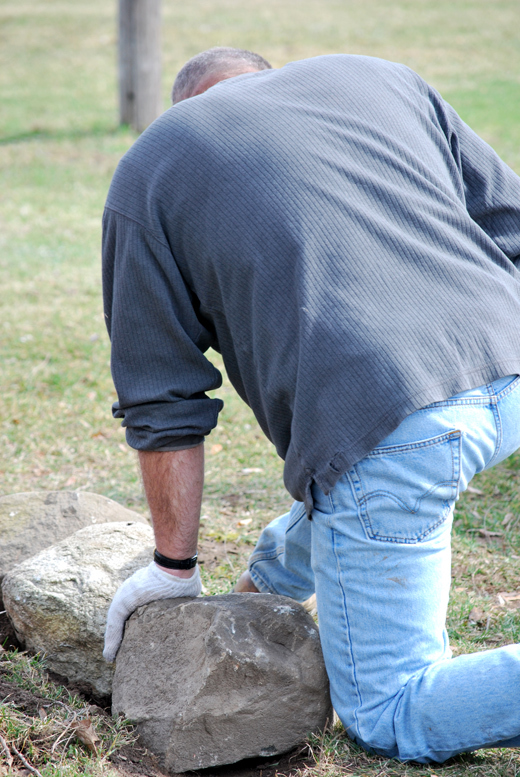 So, while my husband is lugging these rocks around, I direct him where they should go. You know, sometimes a mottled white one should go next to the the smooth, dark one. Or maybe it should be turned just a couple inches to the left or the right. Those rocks are not at all heavy and my husband doesn’t mind a bit. Okay, so maybe I’m exaggerating. The rocks are kind of heavy. And sometimes a pronounced sigh slips out under my husband’s breath. Kind of sounds like graphic design, doesn’t it? My flower bed in its early stages. Got any plant suggestions? Pleasing wives: Not for the faint of heart. In Wisconsin, farm fields are often divided by small streams. 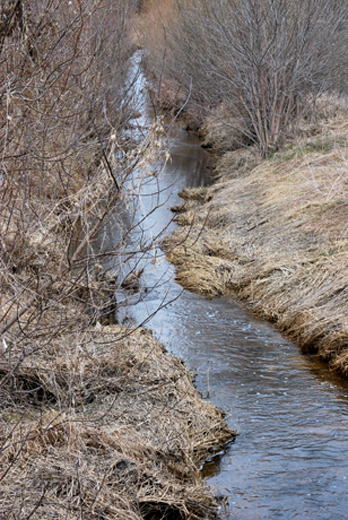 Farmers tend to be more practical than poetic, so they just call them “drainage ditches.” The ditches gather water runoff from the fields and enable them to dry faster. 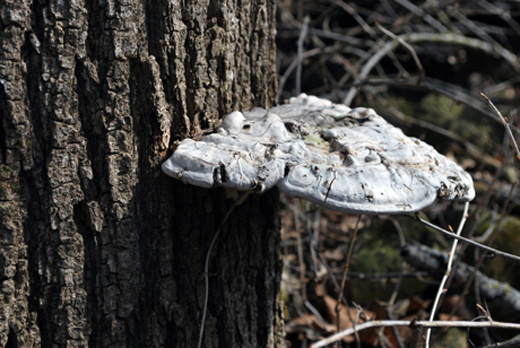 Walking through a woods is an exercise in close observation. I love finding cool things like this. March is pretty much a brown month here. 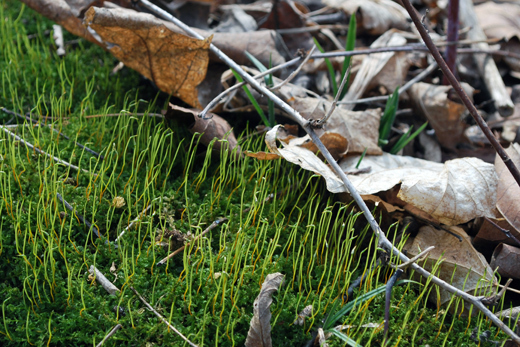 But if you look close, you’ll find a few patches of green moss and ferns popping out amongst the leaves. Not a farmer, I’m really interested that you have to pick the rocks out of the fields year after year. They must just work their way up through the soil. But doesn’t it seem like they’d work their way down? I think the freezing and thawing of winter works the rocks to the surface. Kind of like ice heaves, maybe? Science was never my forte.